Despite now being eighteen weeks along in my pregnancy (almost halfway there, phew! ), I seem to be continuing with my inconsistent approach to blogging, so sorry about that folks. I’m certainly less tired and sick than I was during the first twelve weeks, but I seem to be suffering with terrible back problems instead – still preferable to retching over the toilet every morning though, so every cloud. I’m determined not to turn this into a baby-blog, with nappy-bag reviews and endless updates, but as it’s a pretty big part of my life, expect to see the odd bump photo and pregnancy-related post! This week I had my sixteen-week midwife appointment (at eighteen weeks – in our part of the country everything seems to run late…), and we heard the heartbeat for the first time. They say that with second babies you often feel movements from about sixteen weeks, and as the week went on and I still felt nothing, I started to fret a little. The relief when she found the heartbeat within seconds was in incredible – I literally felt my entire body relax. It seems I’m just growing a very relaxed baby! The midwife recorded the heartbeat as 149-160bpm, which is apparently in line with a girls heartbeat – however, I’m taking this with a pinch of salt, as I know a huge amount of people who were told that the heart rate meant it was a girl, and then at their twenty-week scan saw that it certainly was not! I really have no preference – the only thing I ask for is that he or she is healthy! My ever expanding waistline means that vintage clothes are pretty much no longer an option, so I’ve been browsing the internet for alternatives. I pretty much hate all maternity wear, so tend to wear a lot of tunics and dresses with leggings. 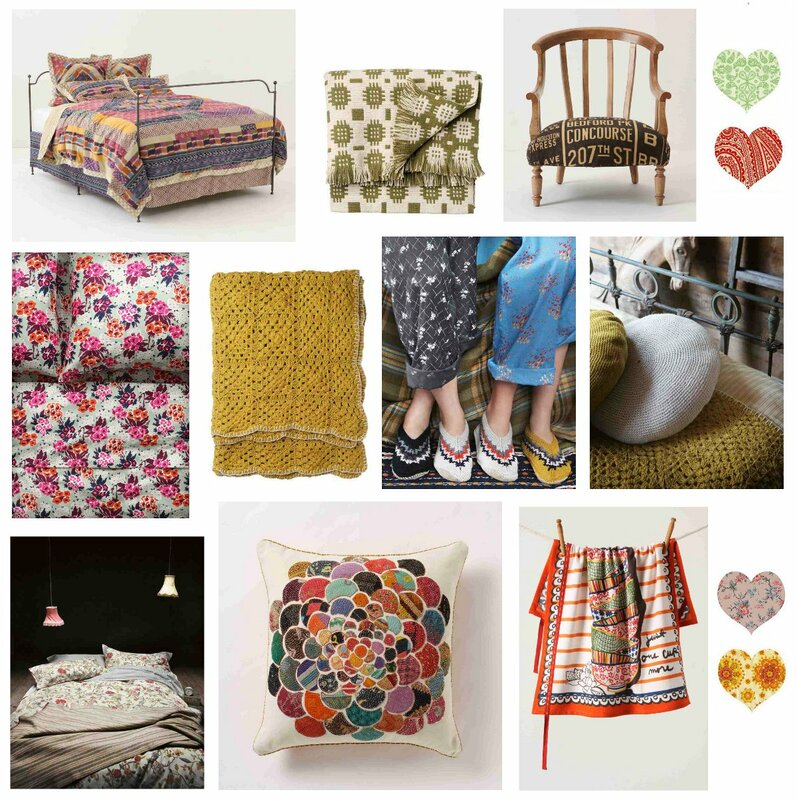 I ended up drooling over my two favourite sites – Anthropologie and Toast, and then got a little distracted with the homewares as well…. and then made a couple of collages…. ahem. I love Autumn, and really celebrate the arrival of cooler temperatures every year. 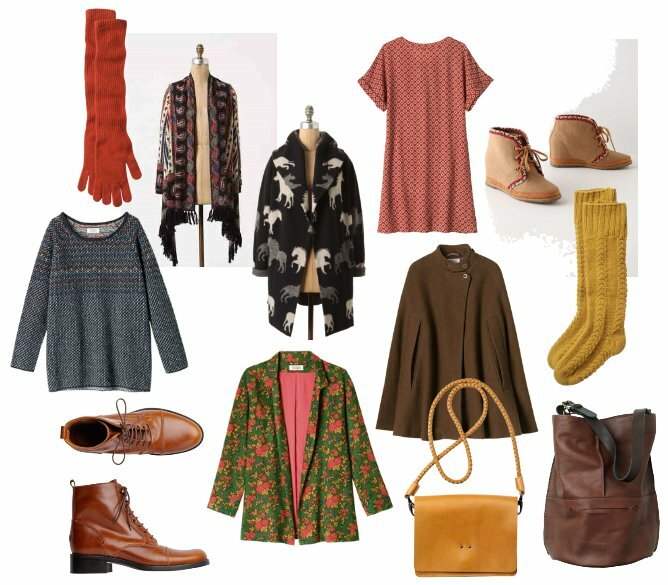 My favourite things to wear; tweed, colourful patterned cardigans, jeans and boots really don’t work too well in the Summer, so as soon as you can see your breath in the mornings, I inwardly cheer. I’m so in love with the clothes that if I bought those, and then bought nothing else forever, I would still be happy. Honest. We’ve had quite a busy couple of weeks, and apart from drooling over things I have no way of affording online, I’ve been embroiled in yet more crochet. I’ve finally gotten round to blocking the ripple blanket (on the floor on a few bath towels – how do other people manage with large crochet projects? ), and have started a granny stripe blanket, in a desperate bid to use up yet more wool. I had the pattern for a granny stripe square in one of my books, but couldn’t for the life of me work out how many chains I would need if I wanted it to be bigger. Luckily, I remembered that Lucy from the glorious Attic24 blog had done a granny stripe blanket last year, and she had kindly written the pattern down for her readers. I was away before I knew it – I’m quite enjoying this one after the ripple, there’s no counting involved, and it’s really easy to just sit and hook away on the sofa in front of the television in the evenings. Or in the cafe before work. Or on my lunch break….. you get the idea! My gardening efforts, unlike my crafty ones, have been pretty fruitless. Despite persisting, and reasoning with myself that if there isn’t enough light to grow vegetables (or even flowers!) on the balcony during the Spring and Summer months, the darker conditions will suit Winter flowering plants excellently, I discovered that apparently this isn’t so. My chard, spinach and kale all floundered sadly, while the cyclamen never even put out a shoot. The most disappointing of all, though, was the radishes, which looked like they were flourishing well – but on pulling one up, I was met with an empty, spindly root. Not even a tiny radish, not even a hint of one. But, all is not lost – I did manage to cultivate a wonderful crop of basil on the kitchen windowsill, and will be turning this into a nice jar of homemade pesto. Alys Fowler would be proud…. The other thing I love about Autumn is that it is probably the most colourful of all the seasons – just driving down the road, or looking out of the window is a pleasure; gold, red and yellow leaves, distant misty purple hills and early morning haziness – lovely. We’ve been indulging in all of the usual October activities – pumpkin carving (and soup making), toffee apple scoffing and, my favourite activity of all, finally lighting the Winter candles in the evening. The ones I’m burning at the moment are left over from last year, and I couldn’t tell you who made them, or what scent they are – I’m sure there are some cloves and cinnamon in there somewhere, but apart from that, your guess is as good as mine! I’ve also started Christmas shopping, although so far it’s only a couple of presents and our Christmas cards – I always buy the charity ones from Paperchase, as they support good causes and are usually the best designs I find. I’m quite excited for Christmas this year, and have started to get organised early – I’m determined to make a lot of presents, and also source handmade ones. I also have a lino-printing kit just begging to be tried, so I’ve decided to print my own wrapping paper again, hopefully with more success than last years Hobbycraft stamps! I’ve also managed to squeeze in a bit of reading over the weekend – whenever the seasons change, I revisit ‘The Wonderful Weekend Book’ by Elspeth Gibson. I love this book, and it always gives me some great ideas for seasonal activities, particularly things to do with the Boy – as soon as I’ve finished this post, we’re off to collect leaves to press and make into an Autumn garland. Followed by lunch at the parents – no matter how old you are, you’re never too old for a family roast! The second book is a real eye opener – ‘Spotted Pigs and Green Tomatoes – A Year in the Life of Our Farm’ is written by journalist Rosie Boycott, and mixes facts about how our food is produced with the adventures of her and her husband, as they delve into the world of smallholding and farming. So far, it’s excellent, and it’s also really helping me on my quest for more ethical living. I’ve found myself looking up more vegetarian recipes (a nightmare when you have a husband who refuses to eat cheese, eggs or broccoli – no, I don’t know how we’re married either…. ), and researching the conditions into which meat is produced. In an ideal world, I would buy a small amount of meat from a local butcher, vegetables from a farm shop, and everything else from a local grocer. In reality, I’m stuck in a small town with two (and to my horror, almost three) supermarkets, no grocers and a market which takes place on a day when I’m at work. I’m getting around it by buying our meat from Waitrose (yes, a supermarket, pah, but their meat is excellent, as is their ethical conscience. Click here for their policies on farming and husbandry), and trying to decide between Abel and Cole and Riverford Organics for a weekly vegetable box. Some of the facts in the book were almost enough to make me go completely vegetarian, particularly those about pigs and chickens, but when it comes to it I always find it a struggle. For now I’ve compromised by simply cutting back on our meat consumption – much to the Husbands horror! Last, but by no means least, we had a birthday in our house. 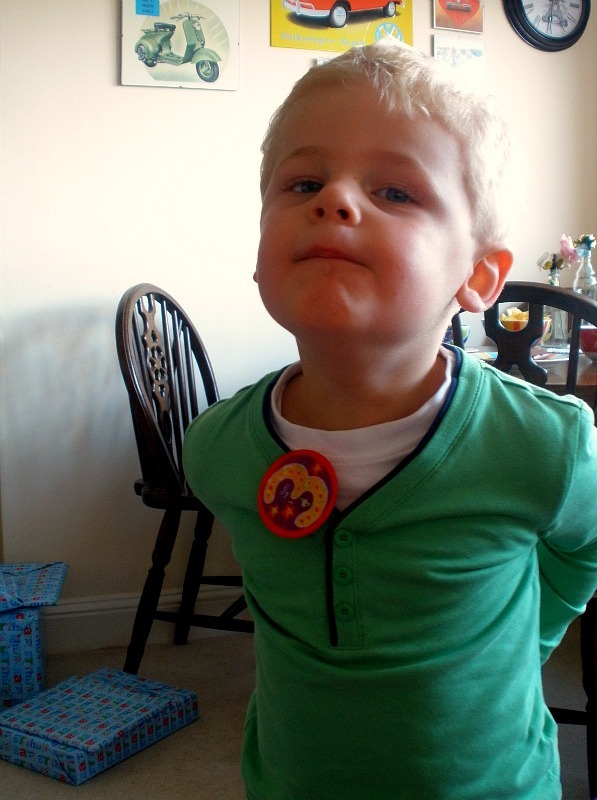 A third birthday to be exact – full of chocolate brownies in a local cafe, hours in the park, and friends and family appearing for an afternoon of tea, cake, and noisy toys. 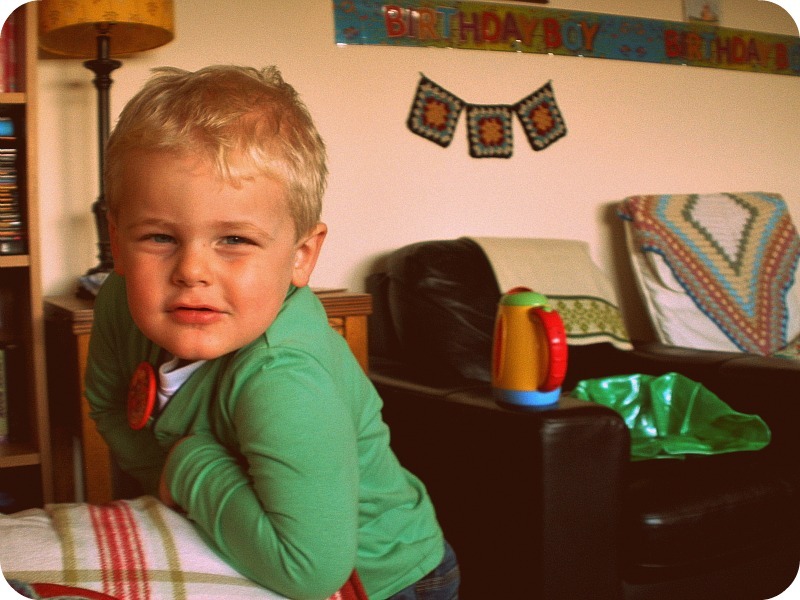 The Boy turned three, and I still find it hard to comprehend where the last few years have gone. My tiny baby is turning (too quickly) into a lovely little man, who (usually) has lovely manners and is always friendly and ready to talk to anyone. Happy Birthday, my precious boy. Well you might not be stopping by as regularly but you make up for it in the length of your prose. Sounds like all is going well. I hope the back pain passes soon. And loving your crochet. Found you via Ravelry – congrats on the new baby. Love all your pics!